Review: “Monsters University” – Don’t be Afraid to Buy It! I have been waiting for the sequel (or in the case of Monsters University, the prequel) to Monster’s Inc. since before Finding Nemo was a twinkle in Disney Pixar’s imagination. As with all sequels, I had my doubts that it would live up to my expectations, but with the success of Toy Story 2 in mind, I sat down with my five-year old daughter and spent a rainy morning enjoying Mike Wazowski and James P. Sullivan, “Sully” make us laugh. 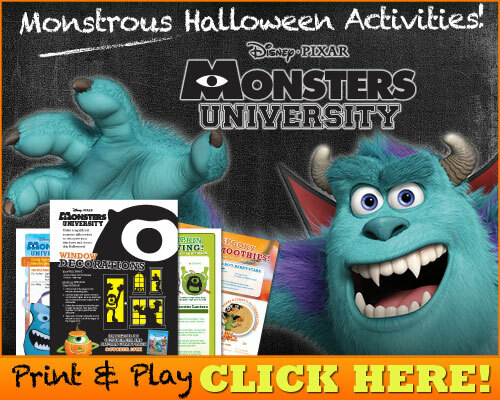 The college-bound monsters of Monsters University do not disappoint their fans. Seeing Mike Wazowski as a little monster with dreams of becoming a great Scarer was very cute. His determination and hard work pay off as he is admitted to the best scaring school, Monsters University (MU). When he meets up with his soon to be best Pal, Sully, their high jinks are guaranteed to earn laughter from young and older viewers alike. The friend’s competitive natures get them into a lot of trouble and even kicked out of the elite MU’s Scare program, but thanks to the help of other misfit monsters as well as one another, the monster’s soon make things right. Through a humorous and well-told story, Monsters University touches on themes of self-discovery and explore how it isn’t always easy to grow up. The star-studded voices of Billy Crystal (Mike Wazowski) and John Goodman (Sully) thankfully return to their former roles and the voice Helen Mirren (Dean Hardscrabble) only add to the monstrous talent of this movie. The release of Monsters University has been made even more special with the edition of the 4-Disc Ultimate Collector’s Edition Blu-ray 3D Combo Pack, 3-Disc Collector’s Edition Blue-ray Combo Pack, and 3-Disc Blue-ray Combo Pack, DVD and On-Demand on October 29th. There are great features to be found on these limited edition releases including behind the scenes look at a day in the life of the Monsters University crew; a look into the challenge of creating a prequel; and a documentary on Randy Newman’s creative process in coming up with the film’s score. My favourite bonus offering on the DVD is the animated short film, The Blue Umbrella. Its sweet story will have you looking at your umbrella differently and is not to be missed; once again proving why Pixar is a leader in animated films. I was lucky to be given a complimentary copy of Monsters University for review. We have already watched it twice and I know it will be watched and enjoyed for years to come. can’t wait to see monsters university as it looks like a fun family movie that my kids would love! We saw this in the theater and really enjoyed it! The Blue Umbrella was great as well.